Optical coherence tomography (OCT) is a light-based imaging technique currently used in clinical diagnostics to examine organs in vivo. The technique uses interferometry; in which light reflected from an examined object combines with reference light that does not encounter the object to generate interference patterns that form 2-D and 3-D OCT images. It is possible to use longer wavelengths of light in the imaging technique for deeper penetration in light scattering materials. Such features offer possibilities for OCT in non-destructive testing (NDT) of samples, and improved non-invasive biomedical imaging. In a recent study, Niels M. Israelsen and co-workers at the Technical University of Denmark, together with collaborators in Austria and the U.K., developed a new method to overcome the technical challenges of OCT imaging. In the study, they obtained images using mid-infrared light to reveal microscopic structures not visible under the conventional shorter wavelength near-infrared light. For this, the team experimentally combined broadband supercontinuum light and frequency upconversion for real-time image acquisition at high resolution. The results are now published in Light: Science & Applications, with potential for promising clinical advances in defect detection and thickness measurements in vivo. The potential to improve depth penetration of OCT by using longer wavelengths has been known since its inception in the early 1990s. 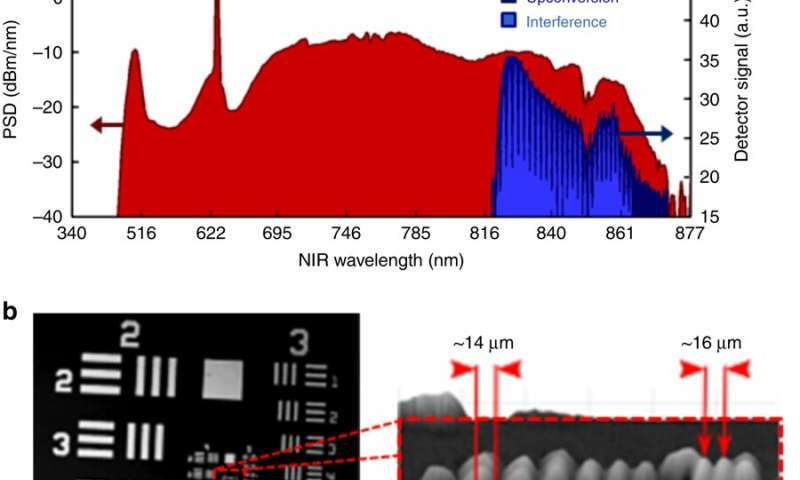 The development of mid-infrared OCT was long challenged by optical components in this spectral region, resulting in slow acquisition, low-sensitivity and poor axial resolution. Israelsen et al. demonstrated the first practical mid-infrared OCT system in the present study. The researchers used a mid-infrared spectral-domain OCT system operating at a central wavelength of 4 micron (µm) to provide an axial resolution of 8.6 µm. The images produced by the mid-infrared system were compared with those delivered using a state-of-the-art ultra-high resolution near-infrared OCT system operating at 1.3 µm. The experimental setup has immediate applications in real-time non-destructive testing of samples that exhibit strong scattering at shorter wavelengths. As an optical technique, OCT is best suited for biophotonics and clinical biomedical imaging, with notable applications in ophthalmology. The technique allows real-time, non-invasive and non-contact measurements for 3-D sample visualization. The setup has rapidly advanced with advanced light sources, detectors and components in the visible and near infra-red spectral region for high-speed and high-resolution imaging in vivo. The OCT system is an industry-ready technology that is robust and easy to implement using low optical power. The main limitation of the system is the strong scattering of light at visible and near-infrared wavelengths that limit the penetration depth in turbid media from a few tens to hundreds of microns, depending on the sample. Characterization of the 4-μm OCT system. a) Superposition of the SC spectra before (red) and after (dark blue) upconversion together with an example of the interference spectrum (light blue). b) Lateral spatial resolution characterization using an USAF 1951 (left) resolution test chart. The smallest resolvable features in the image (right) are elements 1 and 2 in group 6 marked by red arrows, which gives a lateral resolution of ~15 μm. c Sensitivity roll-off curve showing an axial range of up to 2.5-mm OPD. The inset shows a Gaussian fit of the zero-padded A-scan peak at ~100 μm OPD, giving a FWHM axial resolution of 8.6 μm. OCT optical coherence tomography, SC supercontinuum, OPD optical path difference, FWHM full-width half-maximum. Credit: Light: Science & Applications, doi: https://doi.org/10.1038/s41377-019-0122-5. A custom-mid IR supercontinuum (SC) source for illumination, based on a master-oscillator power amplifier (MOPA) pump laser and single-mode zirconium fluoride fiber. 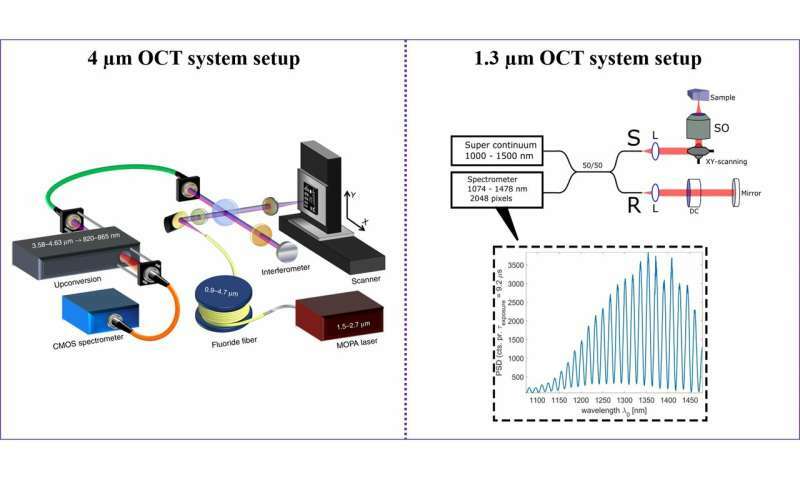 An in-house developed, broadband frequency upconversion system for detection. A silicon complementary metal-oxide-semiconductor (CMOS)-based spectrometer. To ease coupling and alignment between the subsystems, the scientists connected each system with an optical fiber. They then focused the beam generated on to the sample using a barium fluoride (BaF2) lens, the images were acquired by moving the sample on the motorized translation stages. Israelsen et al. collected the sample and reference signals in a single-mode indium fluoride fiber to then relay them to the upconversion module for spectral conversion to the near IR. Thereafter, they demonstrated the superposition of the SC spectra before (red) and after (dark blue) upconversion, alongside an example of the spectrum of interference in light blue. By design, the upconversion module could convert a broad bandwidth of more than 1 µm in the mid-IR region (3576-4625 nm) to a narrow band in the near-IR (820-865 nm) without parametric tuning. The generated near-IR sum frequency signal did not lose any information encoded in the spectral mode of the mid-IR signal. Since state-of-the-art mid-IR detectors suffered from intrinsic thermal background noise compared to their near-IR counterparts, broadband nonlinear frequency upconversion technology allowed for faster and low-noise detection in the study. 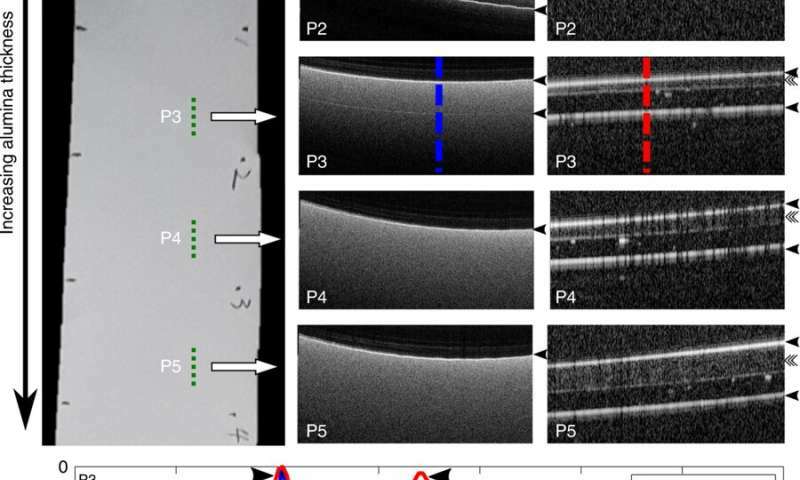 As proof-of-principle of the OCT imaging system developed in the study, the scientists successfully replicated experiments that were previously conducted by Su et al. in industrial ceramics. The previous work had determined that a 4 µm wavelength OCT system was able to image through a milled alumina plate to reveal its internal structure. To test this, Israelsen et al. obtained similar ceramic samples from the same provider; where the ceramic stack contained three layers of plates (C1-C3; zirconium, 476 µm thick alumina and 300 µm thick alumina). The sample was scanned and imaged from the top zirconium plate downwards, the results were consistent with the previous findings. To further support the findings, the scientists performed a series of Monte Carlo simulations using MCX open source software, to qualitatively confirm improved visualization of in-depth interfaces in the 4 µm OCT images. The scientists then showed reduced scattering for 4 µm OCT compared to the 1.3 µm OCT setup using an alumina tape material. The results indicated that image distortion due to dispersion was less pronounced in the 4 µm OCT system. The feature could be useful to characterize silicon-based devices, including microelectromechanical systems, solar cells and waveguides. For 3-D imaging of more complex, non-uniform structures, the scientists imaged a Europay, MasterCard, Visa-chip (EMV chip) and a near-field communication antenna embedded in a standard credit card. Credit cards are commonly made from several laminated polymer layers mixed with a variety of dyes and additives. Using the 4 µm OCT setup, the scientists identified three layers of highly scattering polymers, which could not be penetrated by the 1.3 µm OCT system due to its high scattering properties in the near-IR region. In some instances, they even detected the rear of the card at a thickness of 0.76 mm. Israelsen et al. observed that below the first scattering polymer layer, an encapsulation layer protected the embedded silicon microprocessor. They also observed the bonded wires and circuitry that connected the microprocessor to the underlying gold contact pad. Research work by Israelsen et al. indicated that the 4 µm OCT system was superior to the 1.3 µm OCT system. Since OCT imaging at longer wavelengths increased water absorption in samples this naturally excluded biological samples from the setup. However, the system was remarkably devoid of vibrational resonances (i.e. showed low noise and reduced scattering) and therefore ideal for non-destructive testing (NDT) of solid structures. In this way, Israelsen et al. demonstrated fast, real-time, spectral-domain OCT imaging in the mid-IR region. The resulting axial resolution of imaged samples was as high as 8.6 µm, together with a lateral resolution of 15 µm to obtain microscopic details of structures embedded in highly scattering media. The results were superior in comparison to the more conventional 1.3 µm wavelength OCT setup. The scientists meticulously validated the new results by successfully replicating previous reports. The new work bridges a gap by realizing the mid-IR OCT technology in real-time for practical applications as an industry ready-tool for non-destructive testing.